There are some activities that just stick with you. I’ve always love this Race to Fill the Cup activity from Frugal Fun for Boys and Girls. It’s simple and tons of fun. 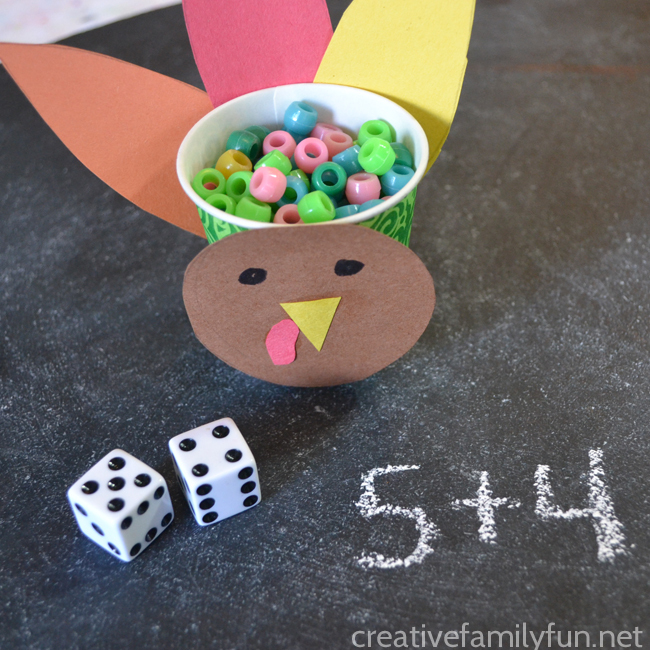 I’ve enjoyed it with my own girls when they were younger and it popped into my head when I was thinking of a Thanksgiving addition game to play. That’s how this Add and Fill Turkey activity came about. I was inspired, added a few twists, made it more advanced, threw in a turkey, and voila – a fun new game. 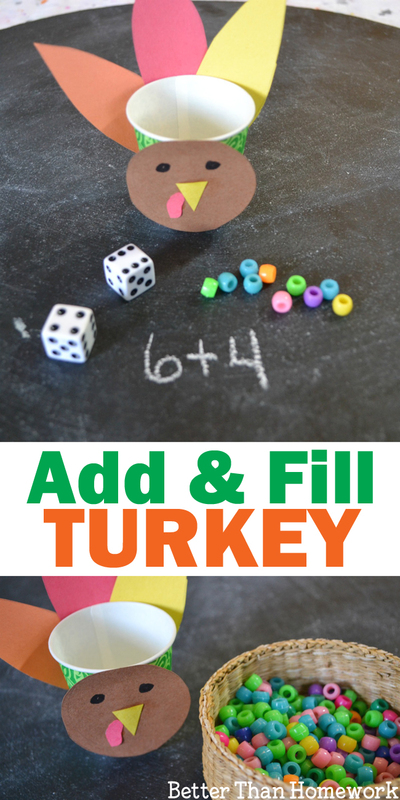 Cut the pieces for your turkey from your construction paper. 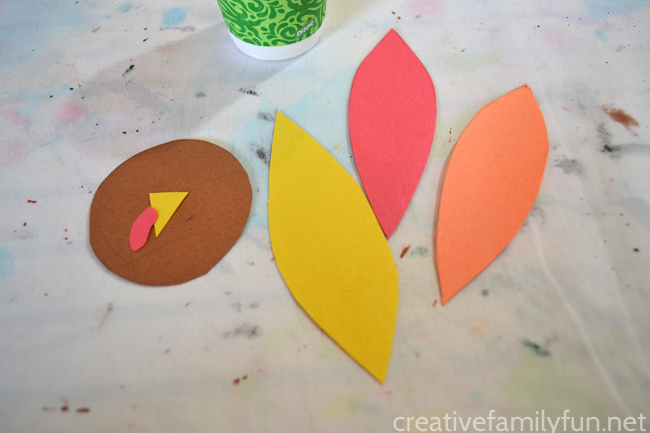 Make a brown circle for the turkey head, a tiny yellow triangle for the beak, and a small red piece for the wattle. Also cut three feathers, one from each of the colors (except the brown) of construction paper. Make the feathers long enough to stick up over the top of your cup. Glue your beak and the wattle to the middle of your brown circle. Use your marker to make a couple of eyes. 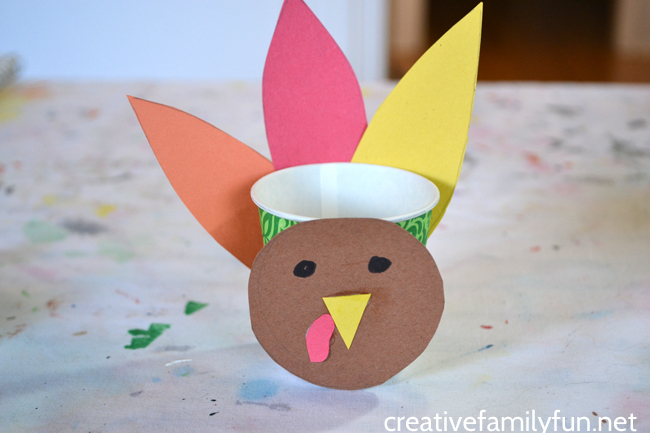 Use the tape to attach the turkey feathers and the turkey head to your small bathroom cup. Your turkey cup is ready to go. It’s time to play! This game is very easy to play. Throw the dice. Add the two numbers together and then put that many beads in your cup. 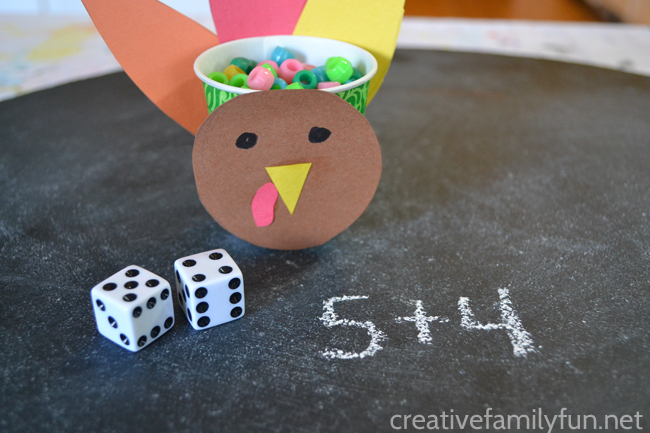 How many dice will your turkey hold? It can take awhile to fill your turkey cup. We had to throw the dice 30 times! If you want a shorter game, use a larger filler or aim to only fill the cup 1/2 way. Make this a two person game. Make two turkey cups. The players can either take turns or race each other to find out who will fill their turkey cup first. Find the total. After you add your two dice together, write down your answer before add your beads to the cup. Keep track of all the amounts and add them all together at the end to find out how many total beads are in your cup. Use more dice. Throw three, four, or even five dice each time. Add them all together and put your beads in your cup. How would you play this math game? 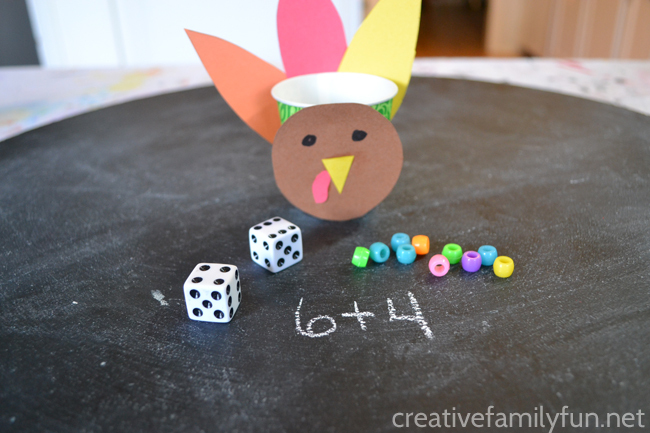 If you enjoyed this Thanksgiving addition game, the above photo is perfect for sharing on Facebook or you can save the photo below on Pinterest.